On Sunday January the 25th 2015, I drove from Mikkeli to Juuka on snowy and icy roads. I started the 290 kilometers / 180 miles long road trip in the night. It took me 4 hours and 15 minutes including two short stops. The weather was cloudy with the temperature -4ºC / 24.8ºF. At arrival there was a surprise to me, because there was freezing rain which is not good for taking photographs, when the lens is pointing towards the sky! Why Juuka which is small municipality in North Karelia region? 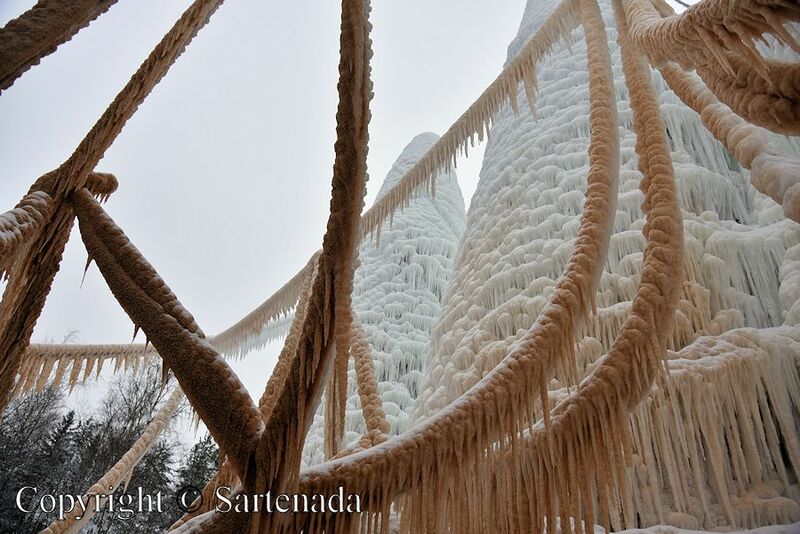 Well, because there was built the World’s tallest Ice Cathedral called Sagrada Familia in ice. Sagrada Família is famous building in Barcelona which was designed by the architect Antoni Gaudí (1852–1926). 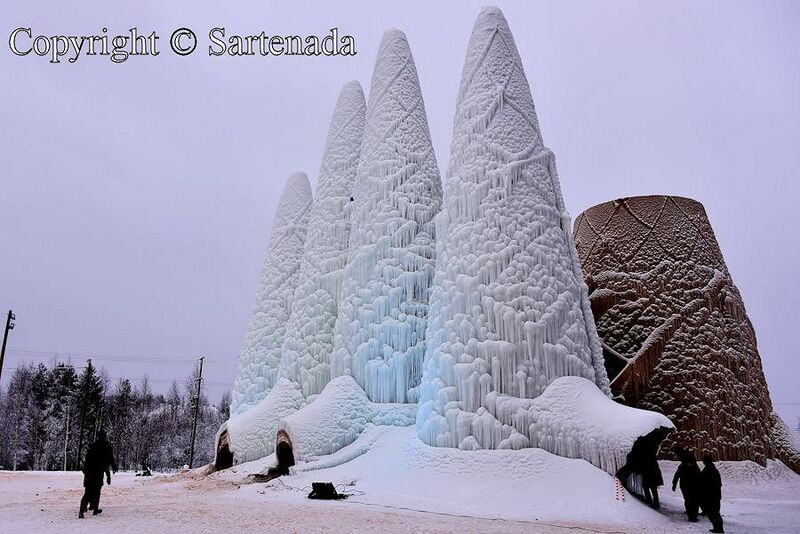 So the Ice Cathedral is some kind of “replica” of Sagrada Família being a joint project of the Eindhoven University of Technology and the municipality of Juuka. 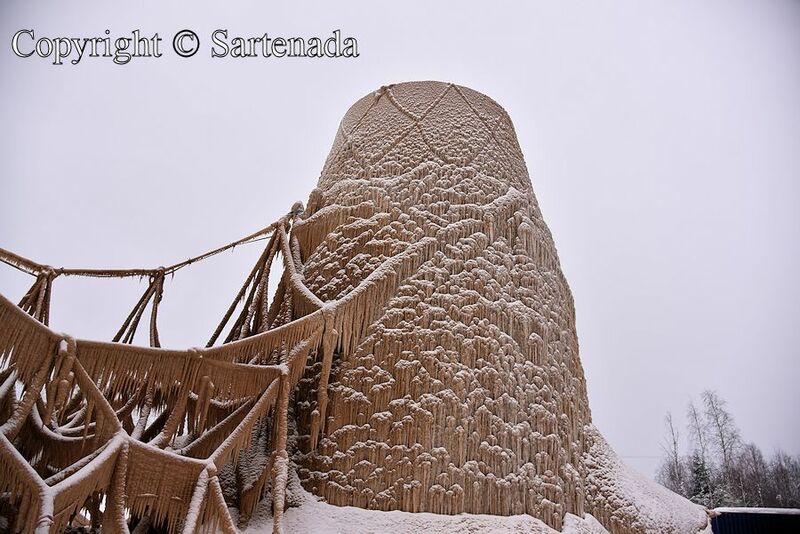 The material which was used for this project is frozen composite material constituted of sawdust and ice. It is called Pykrete! 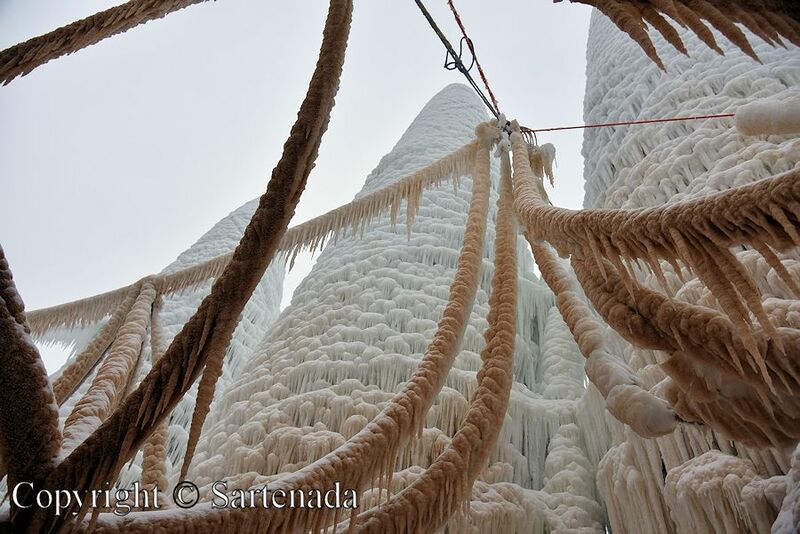 The height of the ice cathedral is 21 meters / 69 feet. Now it’s your turn to see it through my photos. El domingo 25 de enero del 2015, conduje mi carrito de Mikkeli a Juuka por carreteras cubiertas de nieve y hielo. Comenzaba el 290 kilometros / 180 millas largo viaje por carretera en la noche. El viaje me tomó 4 horas y 15 minutos, incluyendo dos paradas cortas. El clima estaba nublado con la temperatura -4ºC / 24.8ºF. A la llegada hubo una sorpresa para mí, porque había lluvia helada que no es bueno para la toma de fotografías, cuando la lente está apuntando hacia el cielo! ¿Por qué Juuka, que es un pequeño municipio en la región de Karelia del Norte? 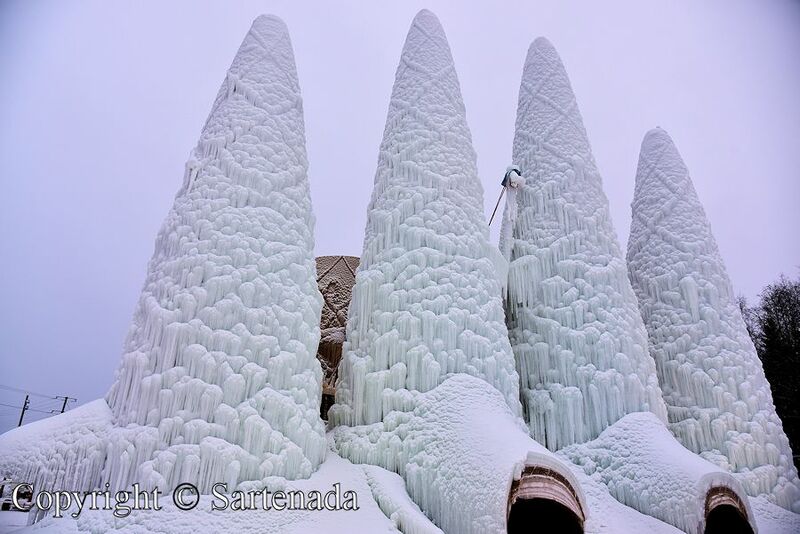 Bueno, porque allí se ha construyó la catedral de hielo más alto del mundo llamado Sagrada Familia de hielo. Sagrada Família es famoso edificio en Barcelona que fue diseñado por el arquitecto Antoni Gaudí (1852-1926). Así que la Catedral de Hielo es una especie de “réplica” de la Sagrada Família siendo un proyecto conjunto de la Universidad de Tecnología de Eindhoven y del municipio de Juuka. El material que se utilizó para este proyecto es de material compuesto congelado constituido de aserrín y el hielo. Se llama pykreto! La altura de la catedral de hielo es de 21 metros / 69 pies. Ahora es Vuestro turno lo ver a través de mis fotos. Le dimanche le 25 Janvier 2015, j’ai conduit de Mikkeli à Juuka sur les routes enneigées et verglacées. Je ai commencé le 290 km / 180 miles long voyage de route dans la nuit. Il m’a fallu quatre heures et 15 minutes compris deux arrêts de courte durée. Le temps était nuageux avec le -4ºC de température / 24.8ºF. A l’arrivée il y avait une surprise pour moi, parce qu’il y avait de la pluie verglaçante qui n’est pas bonne pour prendre des photographies, lorsque l’objectif est dirigée vers le ciel! Pourquoi Juuka, qui est petite municipalité dans la région de Carélie du Nord? 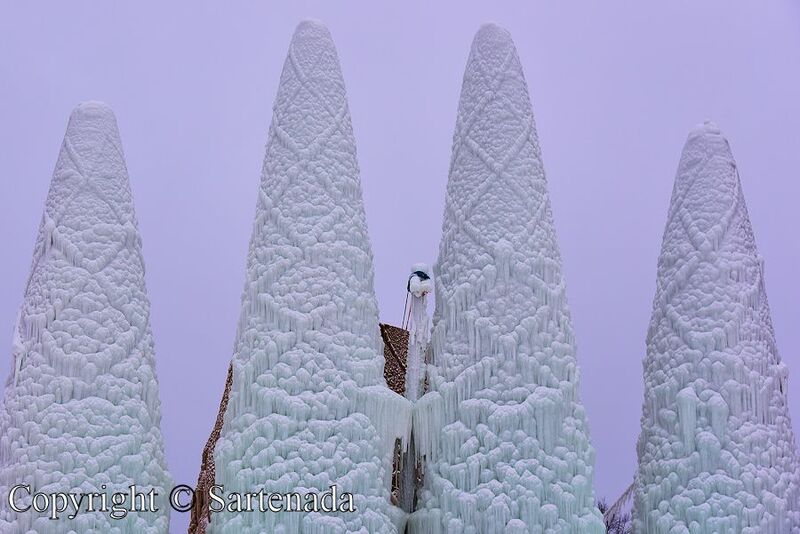 Eh bien, parceque on a construit là, la plus haute cathédrale de glace, appelée la Sagrada Familia de glace. Sagrada Família est le célèbre bâtiment à Barcelone qui a été conçu par l’architecte Antoni Gaudí (1852-1926). 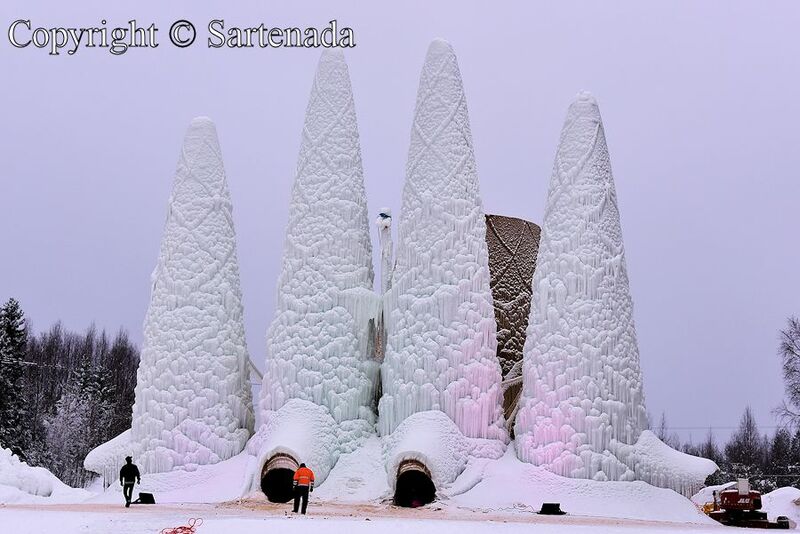 Donc la Cathédrale de glace est une sorte de “réplique” de la Sagrada Família qui est un projet conjoint de l’Université de technologie d’Eindhoven et de la municipalité de Juuka. Le matériau qui a été utilisé pour ce projet est le matériau composite congelé constitué de sciure de bois et de glace. Il est appelé Pykrete! 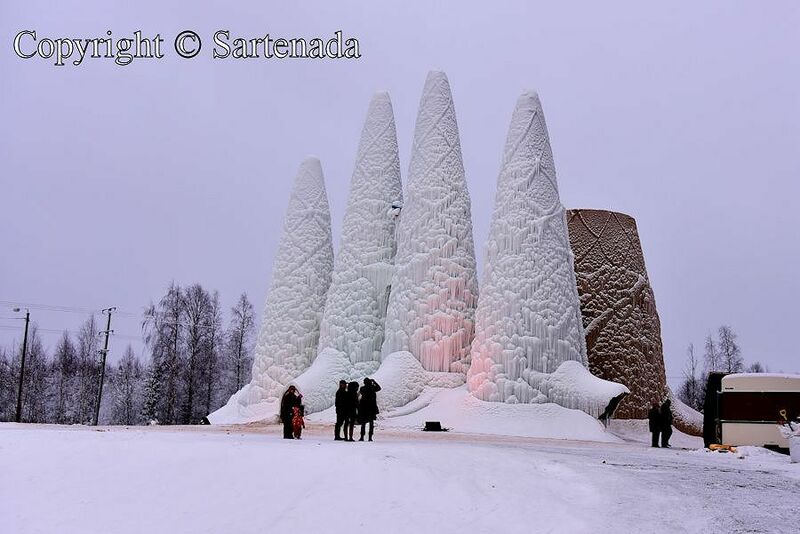 La hauteur de la cathédrale de glace est de 21 mètres / 69 pieds. Maintenant, c’est votre tour de la voir à travers mes photos. No domingo, dia 25 de janeiro, o 2015, eu conduzia de Mikkeli até Juuka nas estradas com neve e gelo. Comecei a 290 km / 180 milhas longa viagem de carro já à noite. Levei 4 horas e 15 minutos, incluindo duas paradas curtas. O tempo estava nublado com a temperatura -4ºC / 24.8ºF. Na chegada, foi uma surpresa para mim, porque havia chuva gelada que não é bom para tirar fotografias, quando a lente está apontando para o céu! Porque Juuka, que é o pequeno município na região da Carélia do Norte? 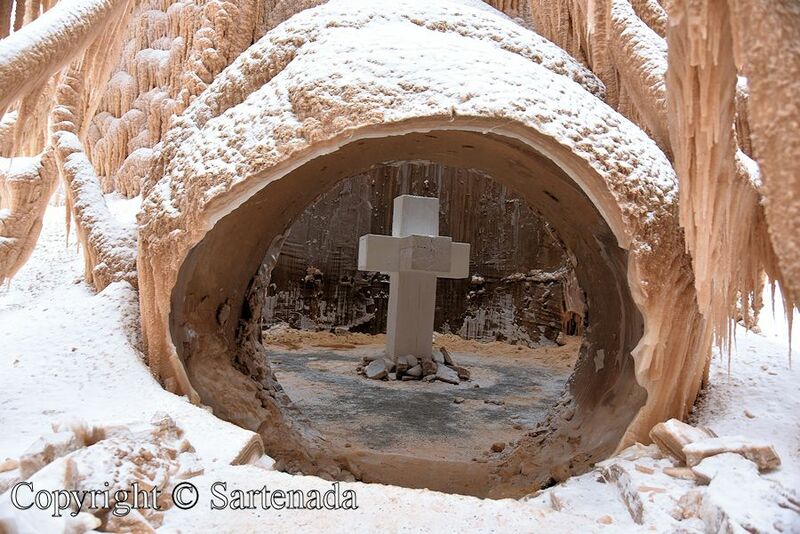 Bem, porque há foi construído a catedral mais alta do mundo em gelo chamada Sagrada Família, em gelo. Sagrada Família é o famoso edifício em Barcelona, que foi projetado pelo arquiteto Antoni Gaudí (1852-1926). Assim, a catedral do gelo é uma espécie de “réplica” da Sagrada Família sendo um projeto conjunto da Universidade de Tecnologia de Eindhoven e do município de Juuka. O material que foi utilizado para este projeto é o material composto congelado constituído de serragem e gelo. Ele é chamado Pykrete! With the material used (pykrete), how long does the structure survive? 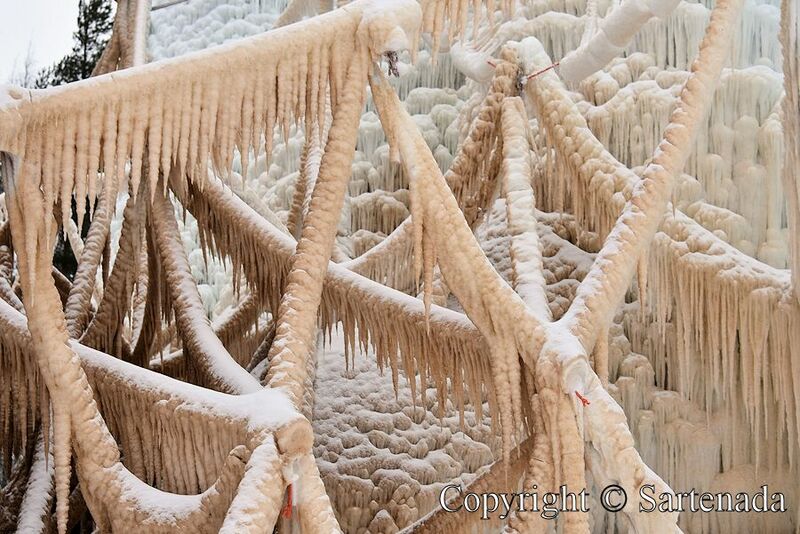 It must be quite amazing to see this ice Cathedral. It is a wonderful building. It is a scene that are not found only in Finland. I am very glad that You loved my post. They were impressive to look. It is most probably that it is unique in the world. In my next post there is absolutely something unique in the whole world. 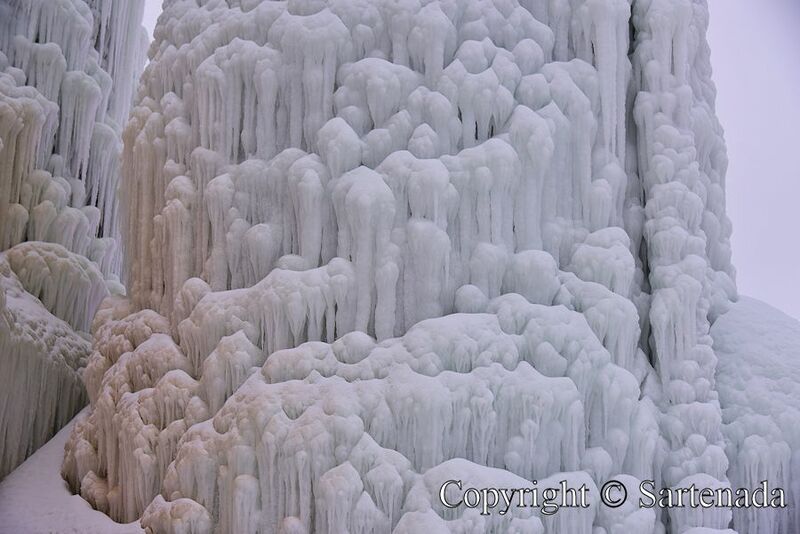 I just returned from a trip to the North and shot photos from World’s Biggest Snow Castle (2013). ありがとうございます. Thank You Sir. It was indeed worth to make that road trip. Merci pour la remarque je saurai la retenir. J’suis très hereux en lisent que tu aimes mon post. I am glad that You made the virtual tour thru my photos. Thank You commenting so kindly. Wow!! These are super impressive! Great images too!! Thank you praising my photos and leaving Your comment. It was great pleasure to read Your kind comment. ありがとうございます. It is a wonderful monument. When I saw the photograph first, I thought whether it was a buffet ship. I thought whether it was a tower of Odin. 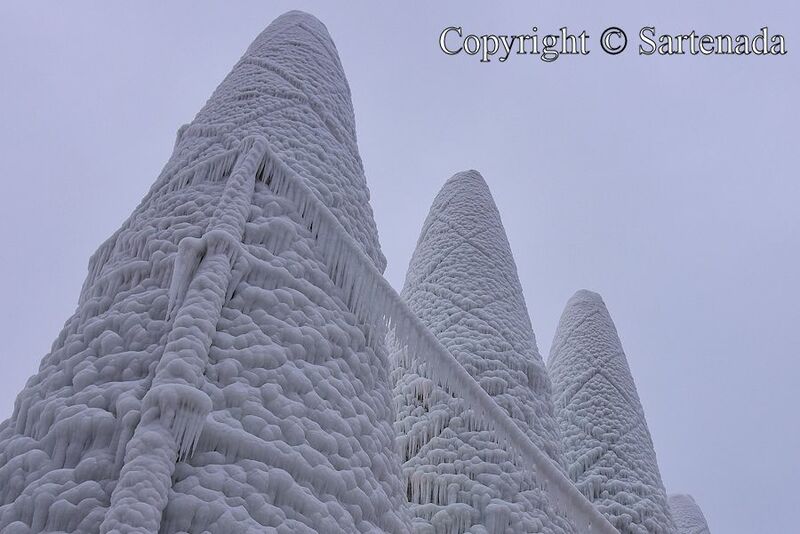 Will there be these towers until a thaw? It is likely that it seems to be Finland. The light is wonderful, too. Nossa!! Que lugar lindo!! Suas fotos parecem verdadeiros cartões postais! Obrigada por dividir essas maravilhas! O seu comentário gentil aquece o meu coração. Finlândia oferece algumas surpresas realmente e no inverno é ótimo tempo para encontrá-las. How long & cool drive! Thank You. In winter it is easy to drive when on day, but at night it is more difficult. Then comes snow and ice and sometimes the loss of perspective is possible when the roads and its edge looks similar. Thank You commenting. This is SO beautiful! In some of the photographs it almost looks like feathers. What a magical place. I am very glad that You did check my photos! Thank You very much for your praising comment. amazing – thanks for sharing this, I had never heard of this place. Thank You leaving Your kind comment. It makes me happy. Great…I have nothing to say any more…Great!!!!! Just enough said. 🙂 ありがとう. That’s really beautiful. Cool in a couple senses of the word! I know there was talk of building ships from Pykrete in WWII, I didn’t realize it was actually used by anyone! Thanks for the pictures. Although living in a county of snow and winter, this was new to me. Thank You leaving Your comment. les photo sont magnifiques ! merci beaucoup pour ce partage sur la cathédrale la plus haute du monde ! Ça va? J’apprécie beaucoup votre louant commentaire. Merci beaucoup. That is an impressive and beautiful creation and your photos display it very well! I am glad when reading Your comment. Thank You. Fascinating, and not at all what I expected to see. Thanks for taking us there through your photos. 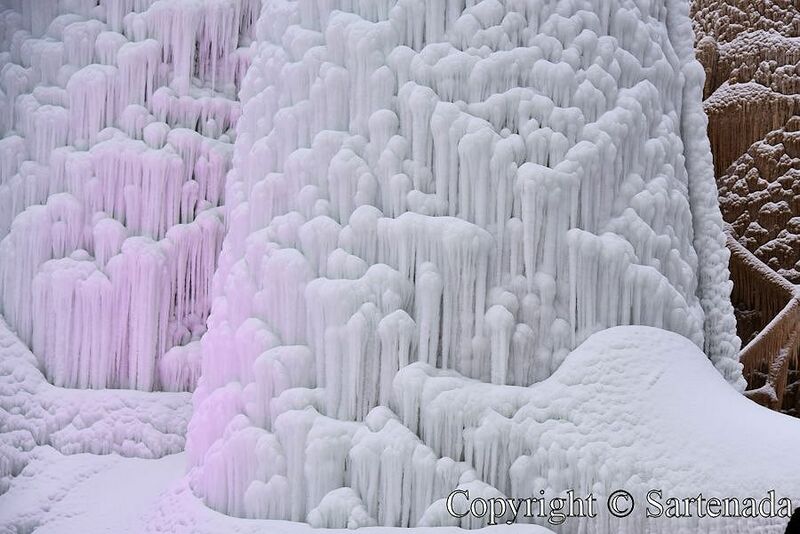 Snow and ice are not easiest material to create something “unbelievable”. It is interesting to see You comment concerning my next post. Snow has main role in it. Thank You commenting. Nice comment. Thank You. This is not so well known even in Finland. I use my calendar if I see some happening in Finland where to visit if possible. Merci de m’avoir faite un commentaire si gentil. car, je ne connaissais pas. Belle soirée à toi et bon weekend. Tes visites sur mon blog sont toujours un grande plaisir pour moi. Merci pour votre aimable commentaire. Thank you, Matti! That’s really extraordinary! I do not know what to say in front of such praising comment! There were indeed visitors around all of the world on the same day when I published this post. Most visitors came from these five countries Mexico (44), Spain (36), Unite States (33), Japan (17) and Guatemala (17). Most far away visitor came from Australia (6), Brazil (2), Vietnam (1) and South Africa (1). Photographing, blogging and driving are things which I love very much and they help me to be “updated” with this modern society. Thank You. Je l’ai vu aussi à Barcelone et c’est pourquoi je ai dû prendre ces photos. Merci pour la remarque! Matti, you continue to amaze me with the wonders in your country you find to show us. Thank For Your kind words. They warmed my heart. 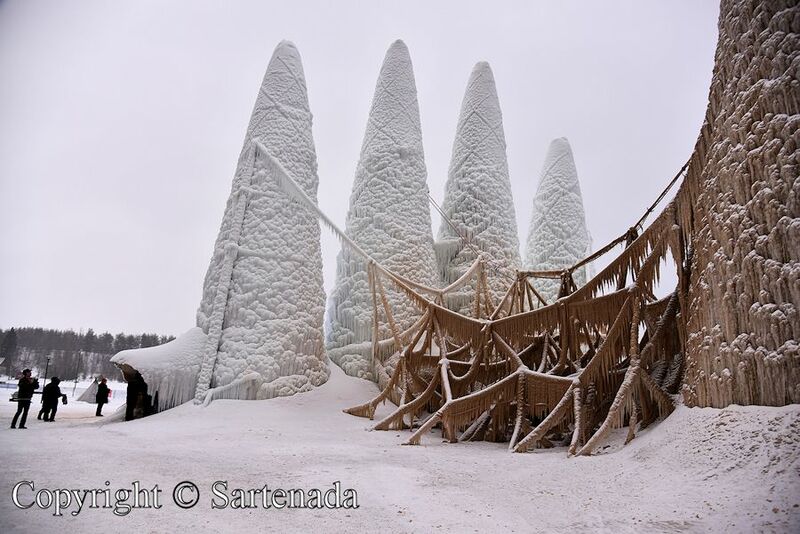 This Sunday morning the temperature is -14ºC / 6.8ºF although sun is shining. After few moments we go to walk on the Lake Saimaa’s ice. We are expecting our first winter snow tonight, followed by freezing rain. I might be walking on ice with you by tomorrow! We had yesterday sunny day and it was a great joy to make ice walk. I am happy that You have possibility to make also walking on ice. Be careful! You got some great photos, even if the weather wasn’t ideal. This is an amazing structure — the detail is amazing, and I really like the way you’ve captured the texture. 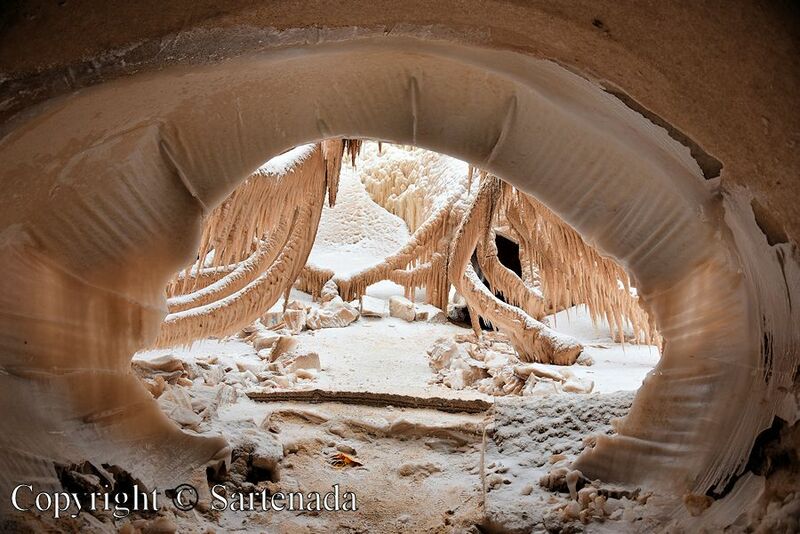 Thanks for sharing this ice cathedral with us. I appreciate Your kind words concerning my photos. Thank You commenting. Wao! 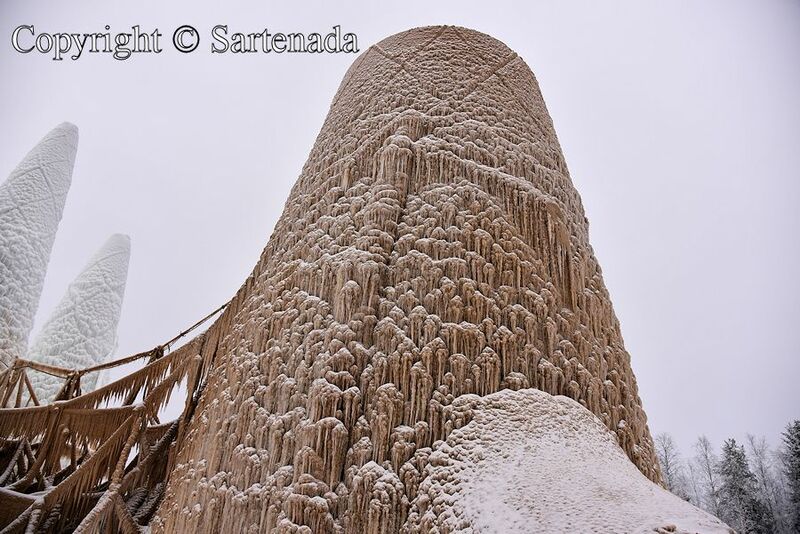 This is snow Sagrada Familia ! Colorful light up is great! I am glad that You loved my photos and left Your comment. ありがとうございます. Merci beaucoup, j’suis ravi que mes photos te plaisent. Gracias por compartir estas preciosuras! Muchas gracias por tus palabras. Me alegro de que te gusten mis fotos. Te deseo, feliz domingo! Abrazos. You loved my hotos. Thank You leaving Your comment. Yes indeed. Our world is wonderful and full of surprises. Man just have to find them. Thank You commenting. How magical appearance! Snow-crowned cathedral looks more beautiful. How nice it was read that you loved my post! ありがとう. How impressive! Well worth the trip – great images, as always! As You saw, there is life in Finland even in winter; we do not hibernate. 🙂 Thank you commenting so nicely. Really amazing! Thank you for sharing! How glad I am that You left Your comment! Thank You. I appreciate Your praising comment very much. Now when having cold winter day, it warmed my heart. Thank You. 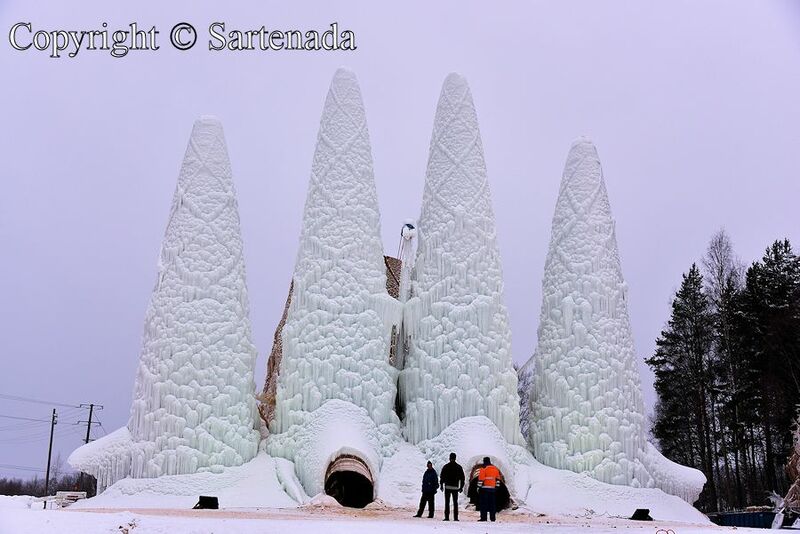 This is amazing ice cathedral! The size is enormous, great photos. Thank You commenting and finding something new among my photos. It was fantastic to see it live. Kiitos kehuista. Valitsin nimimerkin ja nimenomaan tämän nimimerkin sen vuoksi, että haluan olla netissä tuntematon ja tämä nimimerkki on helppo ääntää eri kieliryhmien ihmisten keskuudessa. Absolutely astounding and such gorgeous photos! Thank You leaving so praising comment. I appreciate it very much because You have travelled so much seeing different things around the world. Wow. That is quite impressive! I am very glad that You loved my photos. Thank You commenting. I always look forward to your new pictures. 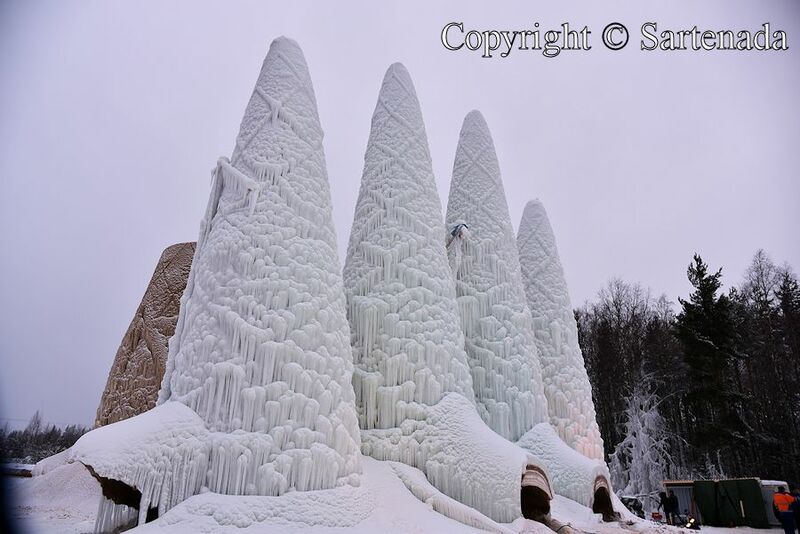 I want to feel the world of ice Cathedral. Colorful space is fantastic …May I come in? This is awesome and unique at same time. The only inside visit was possible thru the corridor of chapel which You in my photos. Inside was really slippery! ありがとう. Thank You commenting this post. I am glad that You loved my photos. Wow, they are stunning, but I think they are not easy to photograph. 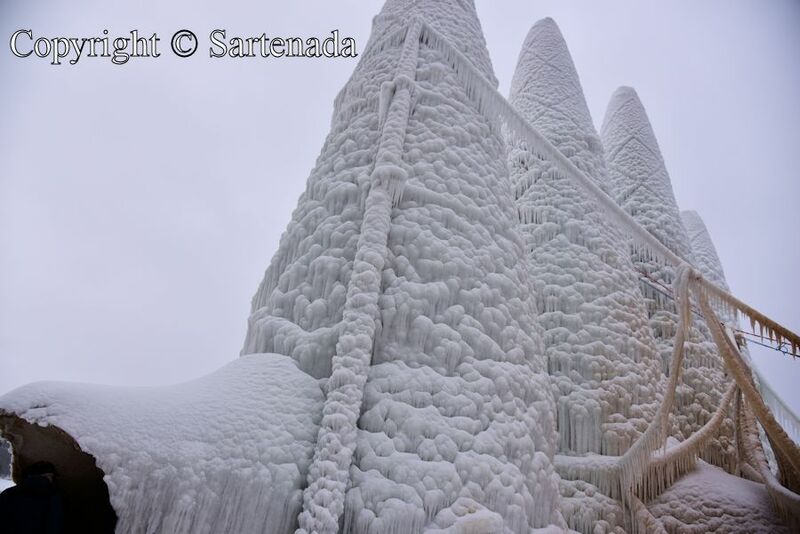 I am glad that You loved my photos from this “replica” presenting Sagrada Familia in ice. The original is in Barcelona, Spain. Thank You commenting. Thank you visiting my blog, checking this post and leavig our kind comment. This is cool. Thank you for posting about it. Nice photos! Thank You leaving Your kind comment and visiting my blog. What an amazing structure – it is very impressive. Beautiful pictures! They were impressive when seeing them live indeed. Thank you leaving your kind comment. Have a great start of a new week! 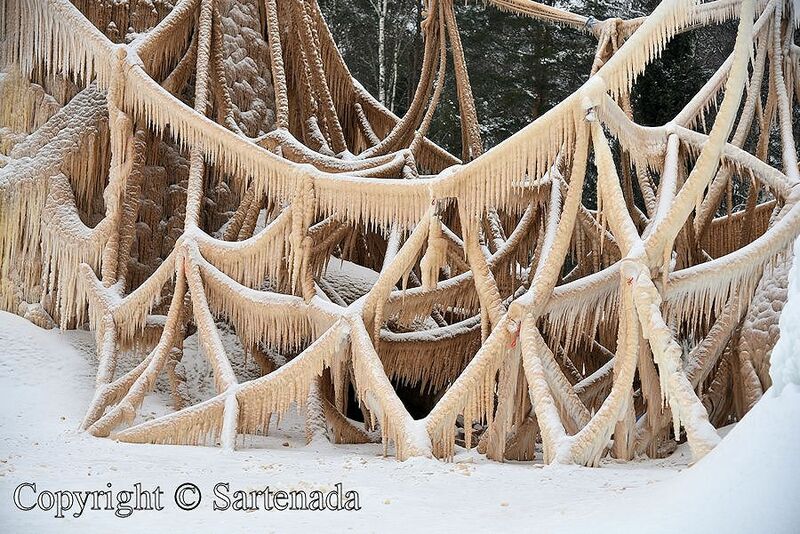 I am ready for winter to be over BUT these are outstanding pictures. Wow! How nice that You visited my blog and left Your kind comment. Thank You. In Finland winter continues, although there are more and more “warm” days. 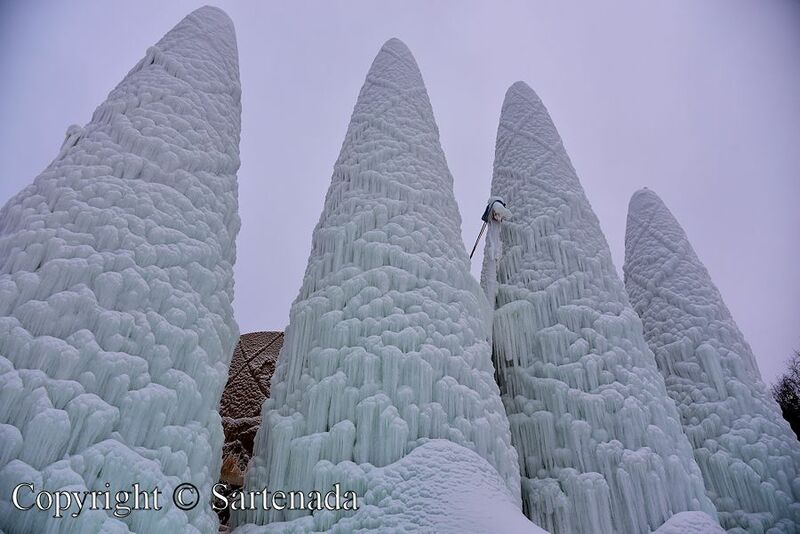 If You read this, then do not miss my next post on Thursday presenting World’s Biggest Snow Castle. 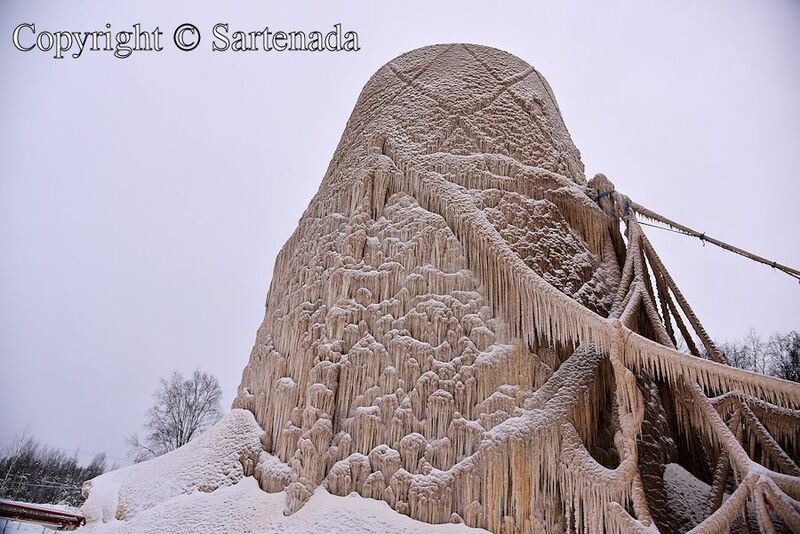 I have been there many times, but this winter it celebrated its 20 years anniversary. Wow, this is totally amazing. And your photos give the location their deserved esteem. Great pictures. How nice to read Your praising comment! Thank You. 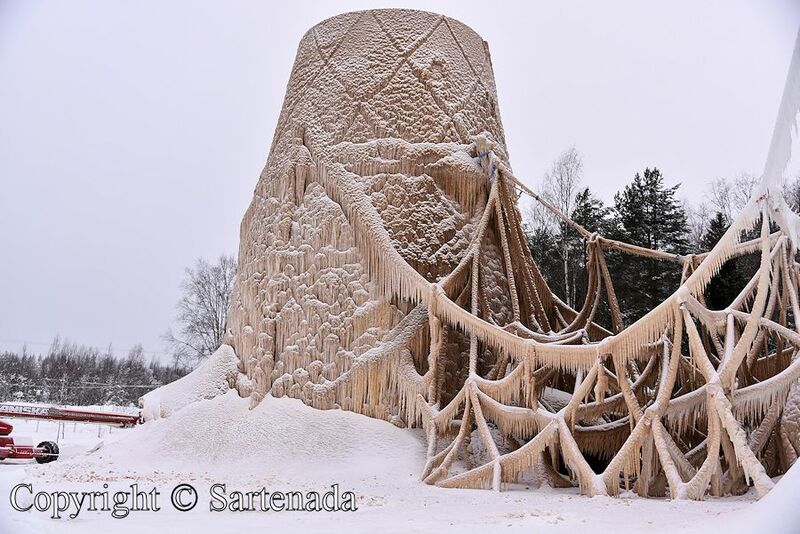 February is the best month to find winter oddities in my country. Next Thursday World’s Biggest Snow Castle. I guess, I will have to read some more about this area of Finland and find out! Thank you. Yes it will melt sometime in March, but all depend from the weather finally. Every winter there is built a new castle with a new theme. 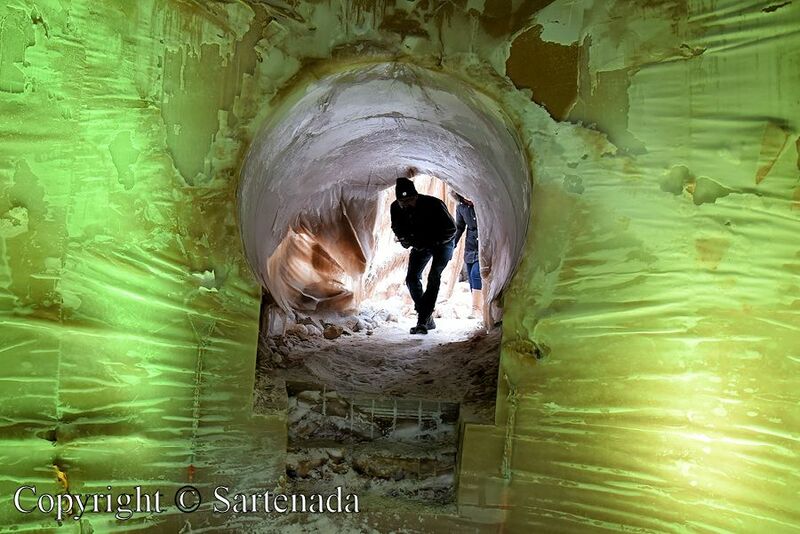 Tomorrow I have photos from this year’s Snow Castle and among them how it was built. 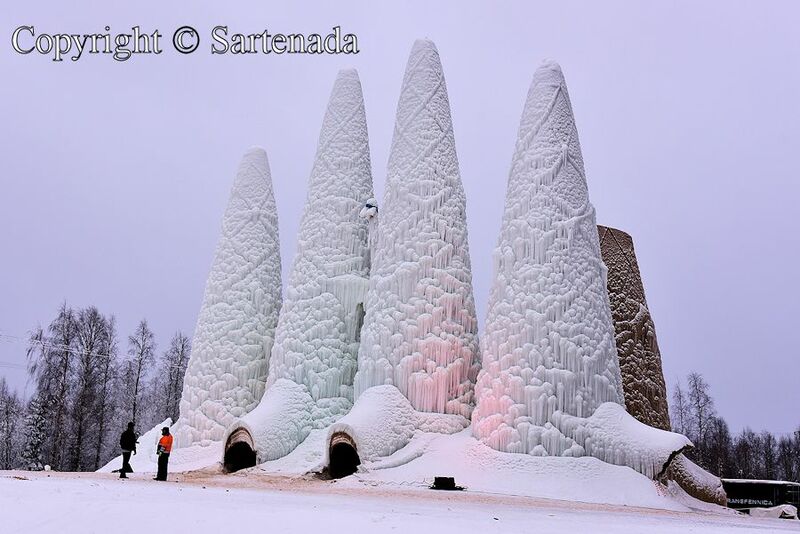 The castle is very near to the Arctic Circle in winter and can be reached easily by train or by bus. Merci de m’avoir fait si gentil commentaire. 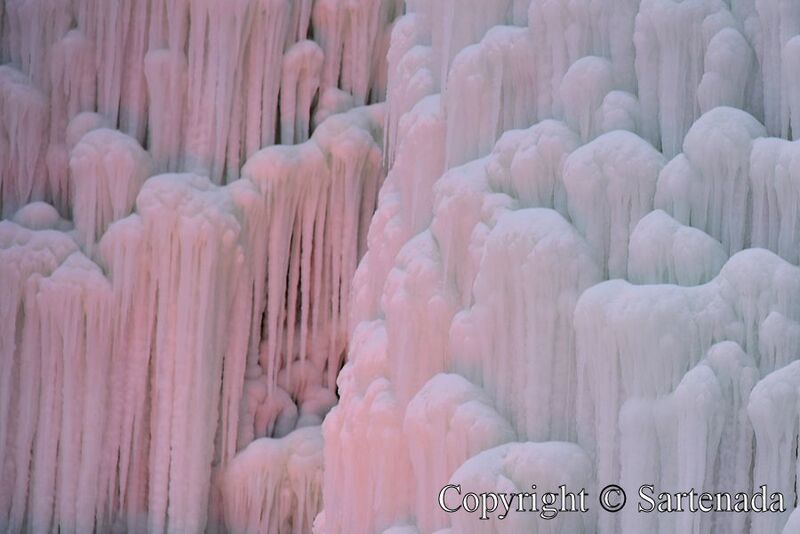 Thank you seeing and commenting this ice cathedral thru my photos. I had read an article about this place some time ago but had a hard time imagining it. Your pictures bring it to life. Your photos give me inspiration for my upcoming trip across the United States – thank you! I am very glad when reading Your kind comment. Seeing them in life was cool experience. Thank You visiting my blog and leaving Your kind comment. Thank you for visiting my page and your nice comments. Your page is awesome! Great work! I am glad that You loved my post. Thank You commenting so nicely. Very nice pictures. 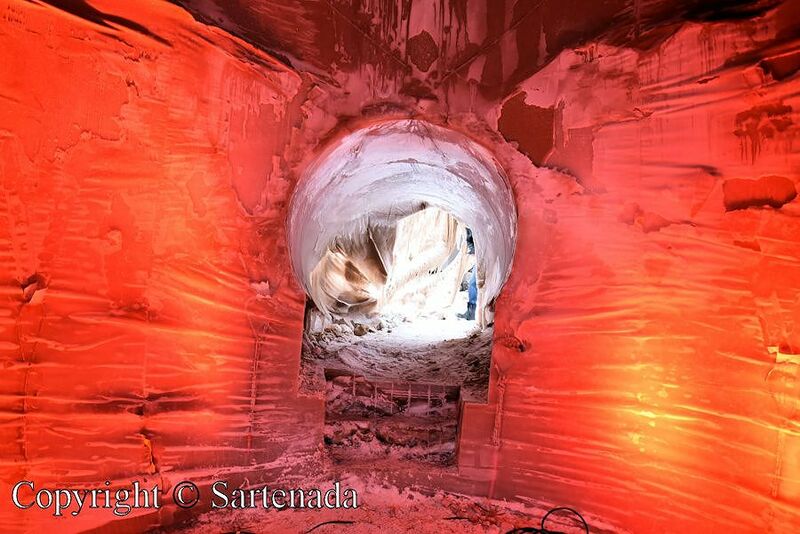 I especially liked the contrast of the orange and other bright colored lights against the Ice Cathedral. Tis was one wonders of our winter. On next Monday something special from my home town! 🙂 I was very delighted when I saw it live. Thank You for Your visit and praising comment. Thank you for your praising comment. Snow and ice start to melt when the weather comes warmer. 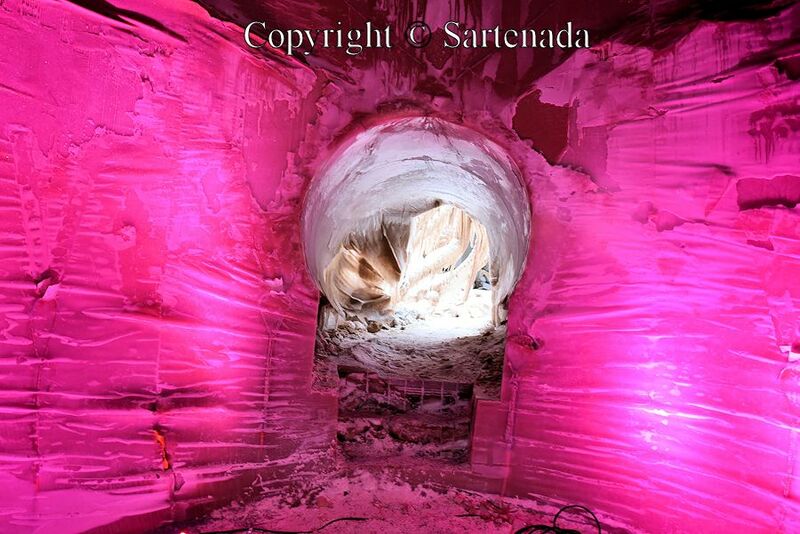 Anyway ice, snow and sand train people to make / build incredible things. I have seen Sagrada Familia live, but for a long time ago. That’s why I wanted to see it built in ice. I am glad that You loved this post. So it seems that my driving thru night on icy and snowy roads was not vain! Matti. You do get around to some amazing places! Well, I try my best to find something interesting in my “unknown” country. 🙂 Thank You for Your kind comment. 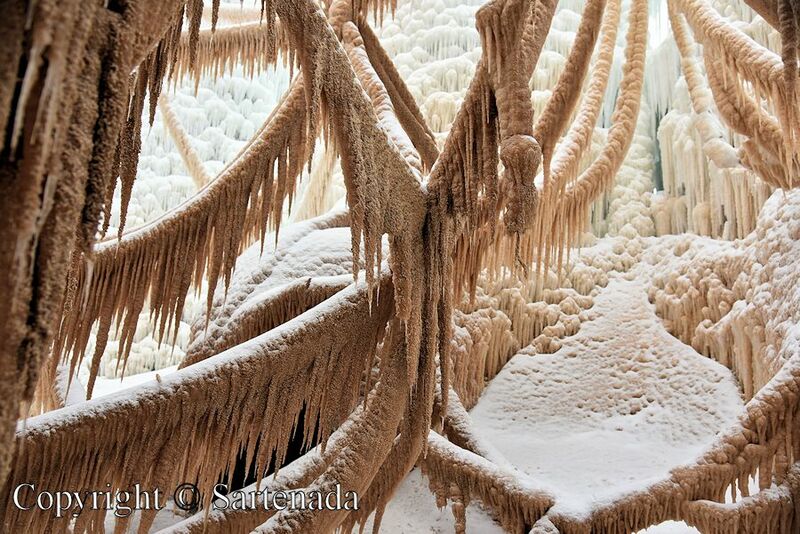 Well, presumably they allow limited number of people in that ice cathedral. The warm breath of people could increase temperatures inside! No, there were no limits. When seeing it live, it was gorgeous. Thank You commenting this post. With the people in front it looks so tall. Really beautiful! Yes when seeing it live, it was amazing. Thank You.